Open all year, Troustrie offers you that peaceful stay - for a few days, or to recharge your batteries as you tour Scotland. 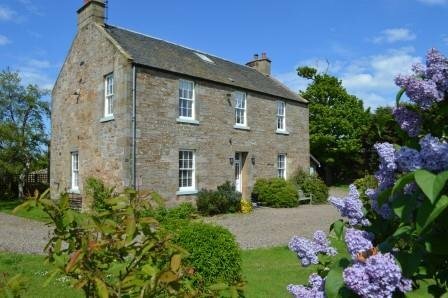 Troustrie House has been lovingly renovated to give our guests a good night's sleep in a traditional farmhouse B&B set in a quiet rural location, a mile from the pretty East Neuk village of Crail, and nine miles from St Andrews, the home of British golf. South facing bedrooms have idyllic views over open fields towards the Firth of Forth and the Isle of May. Four star quality with luxury en-suite bathrooms and cosy goose down duvets. Enjoy tea and home made cakes on arrival in our guest lounge with woodburning stove for those cooler autumn evenings. Delicious breakfasts prepared from organic, free-range and locally sourced produce wherever possible.